She’s better known for her work on television… But, Gina Rodriguez proved to the night’s scene-stealer on the red carpet at this year’s Academy Awards. The 33-year-old Puerto Rican actress and Jane The Virgin star earned the title of Best Dressed Latina at the Oscars. Rodriguez turned heads in a plunging gold Zuhair Murad gown with shimmering accents. 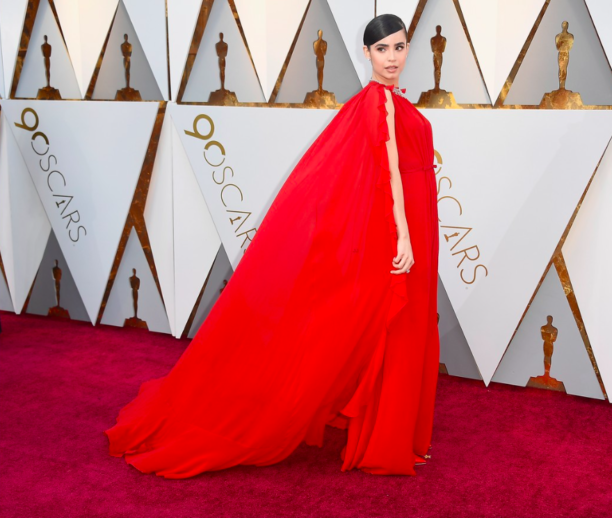 The 24-year-old Colombian American actress/singer and Descendants film franchise star, who served as a host of the Oscars: All Access live stream, wore a caped red dress from Giambattista Valli dress. Carson paired her dramatic dress with Jimmy Choo shoes and a Chopard necklace. The 28-year-old Mexican actress and singer turned heads in a backless yellow dress by Ralph Lauren, which highlighted her incredible figure. Wearing her wavy hair down, Gonzalez added a large bracelet and a pair of drop earrings to the look, and she complemented it with silver-polished nails.